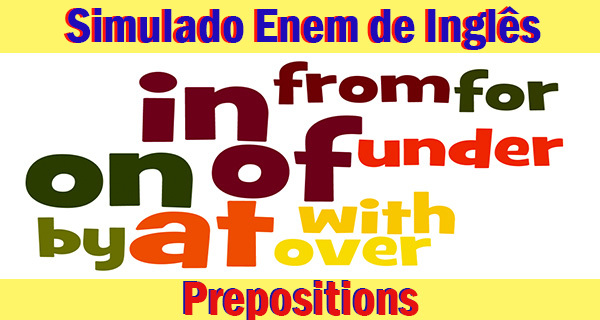 Teste seus conhecimentos sobre Prepositions com nosso Simulado Enem de Inglês. Veja o que consegue acertar, e caso você erre, tem dicas para estudar! Veja! (UFPE) Thirty years __________ John Kennedy’s assassination, many people still cannot believe what happened. Thirty years after John Kennedy’s assassination, many people still cannot believe what happened. A special investigation helps explain why. After the shooting, top officials scrambled to conceal __________ own intrigues and mistakes, leaving openings for dark conjecture – and a nation forever uneasy. The children have been ill ……………………….. two months. They haven’t had a good breakfast ………………………. weeks. In fact, they haven’t had a good breakfast ……………………………. last October. (UNICAP) The boys and girls are playing ______ the garden. Assinale as afirmativas verdadeiras e as falsas. I – You’ll get to the village more quickly if you take this passage ______ the fields. II – If you want the bus station, go ______ this road and turn left. III – The ball passed _____ the window and broke the new vase of Antonio’s mother. IV – Cassiane travels _____ the world mainly for pleasure. V – Santos Andrade Square is ______ Federal University of Paraná and Guaira Theatre. I – What are you thinking ________? II – He died ________ the injuries caused by a terrible accident. III – They succeeded ________ breaking the door open. IV – Everybody laughed ________ him when he said that. V – Why don’t you concentrate ________ your studies?